In the audio recording, Andy first presents his thoughts on the revised GMSF [Jan 2019]. This is followed by a question & answer session. We’re not going away Andy! The local community came together at Thornham Cricket Club on Saturday 2nd February 2019 to hear about the revised Greater Manchester Spatial Framework [GMSF] and air their views about it. Ordinary residents across Greater Manchester are looking at the revised GMSF in disbelief. Ten of thousands of people looked the original plan and say ‘NO’. 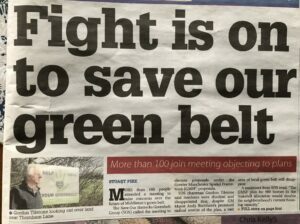 In particular large numbers said ‘Save The Greenbelt’. “Andy Burnham said he’d rewrite the plan. Well he hasn’t, he’s tweeked it round the edges and put some gloss on it, Not a botch job, but it hardly looks like a tradesman has been near it – very back of a fag packet” said Barry. 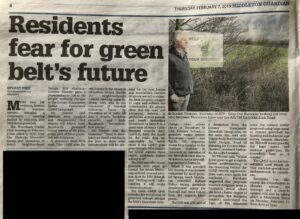 Yes the 850 or so properties in the Slattocks/Stakehill/Chesham Area are set to be engulfed by 900 new homes and a further 250,000 sq metres of industrial units. With roads already clogged at peak times and motorway closures causing overnight noise and pollution, this extra development is likely to cause havoc. Planners say they’ve thought about it and know their solutions will work. We don’t think they really have. Whilst the move to non-polluting electric vehicles is said to inevitable that doesn’t lessen number of vehicles on the roads. Yes, a number of people can and will walk, cycle and use public transport to get around. But, some people rely on their cars, other use taxis as a matter of course. “Public transport needs to be much more convenient and much, much cheaper than it is and I can’t that happening very soon” said Ian, a local resident. “Yes, I love my exercise but how long would take me on the bus? I can’t walk over the lanes to a ‘Latics game – and walk back to Slattocks? That goes beyond dedication” said John, a season ticket holder. Where does it leave residents who suddenly find themselves living within the newly designated Greenbelt? Yes, planning permission on Greenbelt land can by extremely difficult to obtain, if not impossible. But it should come as no surprise that local Councils and the Greater Manchester Combined Authority [GMCA] seem to think it’s perfectly alright to sweep a broad brush over people’s lives when it suits. Well – all of a sudden, the rules are being changed because apparently those very same local Councils and GMCA have decided. Is this the right way to treat local resident? And how can they trust their elected representatives?